Effect of Al substrate nitridation on the properties of AlN films grown by pulsed laser deposition and its mechanism_News_SiC Wafer,GaN Wafer,GaAs Wafer,Ge Wafer--XIAMEN POWERWAY ADVANCED MATERIAL CO.,LTD. High-quality AlN films have been grown on nitrided Al substrates by PLD. Effect of Al substrate nitridation on the properties of AlN films grown by PLD is carefully studied. Growth mechanism of AlN films grown on nitrided Al substrates by PLD is hence proposed. AlN films have been grown on nitrided and non-nitrided Al substrates by pulsed laser deposition (PLD) technology at 450 °С. 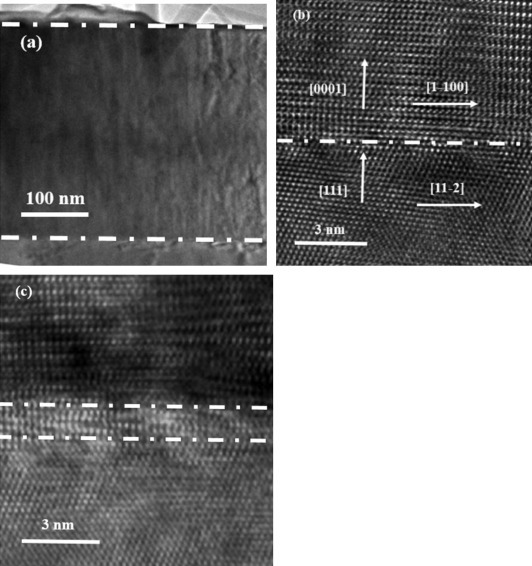 The surface morphology, crystalline quality, and interfacial property of the as-grown AlN films on nitrided and non-nitrided Al substrates have been investigated systematically. It is found that the as-grown ∼300 nm-thick AlN films on nitrided Al substrates show the very smooth surface with a root-mean-square (RMS) surface roughness of 1.5 nm, high crystalline quality with full-width at half-maximum (FWHM) values for AlN(0 0 0 2) and AlN(1 0 −1 2) X-ray rocking curves (XRCs) of 0.6° and 0.9°, and sharp and abrupt interfaces. These results are in striking contrast to those of ∼300 nm-thick AlN films grown on non-nitrided Al substrates. The as-grown ∼300 nm-thick AlN films on non-nitrided Al substrates show relatively rough surface with a RMS surface roughness of 4.0 nm, poor crystalline quality with FWHM values for AlN(0 0 0 2) and AlN(1 0 −1 2) XRCs of 1.1° and 1.5°, and a ∼1.5 nm-thick interfacial layer. Based on the characterizations, the effect of Al substrates nitridation and the growth mechanism of AlN films grown on nitrided Al substrates by PLD are hence proposed. This work provides an effective approach for the growth of high-quality AlN films on Al substrates for the future application of AlN-based devices. III-nitride semiconductors AlN, GaN and InN from a continuous AlGaInN alloy system with the direct band gaps ranging from about 0.7 eV for InN to 6.2 eV for AlN with 3.4 eV for GaN, and the band gap covers the whole range from UV to IR ,  and . Therefore, the III-nitride semiconductors attract considerable attention for the application of light-emitting diodes (LEDs), laser diodes (LDs), high electron mobility transistors (HEMTs), etc. ,  and . Among these III-nitride semiconductors, AlN has highest surface acoustic wave (SAW) velocity, breakdown dielectric strength, etc., which makes it promising for the application of thin films bulk acoustic wave resonators (FBARs) and SAW devices and . So far, AlN-based devices grown on sapphire substrates have been commercialized. However, there are several shortcomings existing in these AlN-based devices  and . On the one hand, the thermal conductivity for sapphire is as low as 22 W/(m K), which can't conduct out the generated heat in the devices, and thereby result in the poor performance of devices . On the other hand, the lattice mismatches between AlN and sapphire are as large as 13.2%, which would lead to a formation of many dislocations during the initial growth process, and eventually result in the poor-quality AlN films . In this regard, substrates have high thermal conductivity and show small lattice mismatch with AlN are of paramount importance for circumventing this issue. However, the substrates with high thermal conductivity are normally thermally active, which are unstable at high temperature and may react with the films, and eventually lead to the failure of epitaxial growth  and . Therefore, traditional epitaxial growth technologies, such as metal–organic chemical vapor deposition (MOCVD), and molecular beam epitaxy (MBE) are not suitable for the growth, due to their requirements of high growth temperature  and . Nowadays, pulsed laser deposition (PLD) has been demonstrated to be an effective approach for the growth of AlN films on thermally active substrates, such as Cu, Ag, Al, etc., which show relatively small lattice mismatch with AlN. Among these substrates, Al substrates have high thermal conductivity of 237 W/(m K) and show very small lattice mismatch with AlN of 8.9%, and have been widely used to grow AlN films . Previous works have studied the growth of AlN films on Al substrates by PLD or MBE,  and . It was reported that by the nitridation of Al substrates, the AlN films have been successfully grown on Al substrates by PLD . However, the effect of Al substrates nitridation on the properties of AlN films grown by PLD, as well as the mechanisms of the AlN films grown on nitrided Al substrates, lacks thorough study. In this work, we report on the growth of AlN films grown on nitrided and non-nitrided Al substrates by PLD. The effect of nitridation of Al substrates on the surface morphology, crystalline quality, and interfacial property of as-grown AlN films on nitrided Al substrates is studied carefully, and the corresponding mechanism of AlN films grown on nitrided Al substrates is hence proposed. This work provides an effective approach for the growth of high-quality AlN films on Al substrates. The as-received Al(1 1 1) substrates with the size of 1 × 1 cm2 were bought from Hefei Kejing Materials Technology Co., Ltd. The as-received Al(1 1 1) substrates were put into an ultra-high vacuum (UHV) load-lock chamber with a background pressure of 1.0 × 10−8 Torr, and then were degassed at 200 °C for 30 min. The as-degassed Al(1 1 1) substrates were transferred into an UHV PLD chamber with a background pressure of 3.0 × 10−10 Torr. Subsequently, the as-transferred Al(1 1 1) substrates were annealed at 550 °C for 60 min to remove residual surface contaminants and create atomically flat Al surfaces. Afterwards, the as-annealed Al(1 1 1) substrates were nitrided in a 4 mTorr high-purity (7N) nitrogen plasmas ambient produced by a radio-frequency (RF) plasma generator attached to the PLD system and working at 500 W for 60 min at 550 °C. Finally, a KrF excimer laser light (λ = 248 nm, t = 20 ns) was used to ablate the high-purity AlN (4N) in a nitrogen pressure of 4 mTorr. The energy density of the laser was set to be 3.0 J cm−2 with a pulse repetition of 30 Hz. The ablated species were then directed onto the substrates, which were mounted 80 mm away from the target and were maintained at 450 °C for the growth of AlN films. To study the effect of Al substrates nitridation on the property of AlN films, another epitaxial growth was carried out under the same growth conditions except for the non-nitridation of Al substrates. The as-grown AlN films on nitrided and non-nitrided Al substrates were characterized by in-situ reflection high energy electron diffraction (RHEED), energy dispersive X-ray spectroscopy, atomic force microscopy (AFM, Bruker Dimension Edge, American), high-resolution X-ray diffraction (HRXRD, Bruker D8 X-ray diffractometer with Cu Kα1 X-ray source λ = 1.5406 Å) and high-resolution transmission electron microscopy (HRTEM, JEOL 3000F). As for the TEM measurement, the as-grown AlN films were polished by mechanical polishing followed by low-energy and low-angle ion milling (Fischione 1010 Low Angle Ion Milling & Polishing System), ending up with the sample edge thickness of ∼20 nm. The cross-sectional samples were then put into a JEOL 3000F field emission gun TEM working at a voltage of 300 kV, which gives a point to point resolution of 0.17 nm. The in-situ RHEED was deployed to monitor the growth process of AlN films grown on nitrided and non-nitrided Al substrates. It was found that sharp and abrupt RHEED patterns for Al substrates can be clearly identified after Al substrates were annealed at 550 °C for 60 min shown in Fig. 1a. After annealing, the Al substrates were nitrided at 550 °C in a nitrogen plasmas atmosphere with the pressure of 4 mTorr. One can clearly note that spotty RHEED patterns shown in Fig. 1b, can be found after the nitridation process, which demonstrates that AlN islands were found during the nitridation process and the thickness of nitridation layer is determined to be ∼2 nm by studying these patterns. Subsequently, the as-nitrided Al substrates were used to grow AlN films.Fig. 1c is a RHEED pattern for as-grown ∼300 nm-thick AlN films grown on nitrided Al substrates at 450 °C, where streaky RHEEDs can be observed. This result reveals very smooth AlN surfaces. On the contrary, ∼300 nm-thick AlN films grown on non-nitrided Al substrates show relatively rough surface with spotty RHEED patterns, as shown inFig. 1d. Evidently, the nitridation of Al substrates plays an important role in growing high-quality AlN films. After careful study, an-plane epitaxial relationship between Al and AlN films of AlN[1 1 −2 2]//Al[1 −1 0] can be obtained  and . In this case, the afor Al is 0.4040 nm, and therefore the corresponding length of aAl/2 Al[1 −1 0] is measured to be 0.2857 nm; while the a for AlN is 0.3112 nm, and the corresponding length of aAlN AlN[1 1 −2 0] is calculated to be 0.3112 nm, as shown in Fig. 1e. In this regard, the lattice mismatch between AlN and Al is determined to be 8.9%  and . RHEED patterns for (a) as-annealed and (b) as-nitrided Al substrates. RHEED patterns for the as-grown ∼300 nm-thick AlN films on the (c) nitrided and (d) non-nitrided Al substrates. (e) The schematic structure of the lattice arrangement of AlN films grown on Al substrates. The AFM measurement was also adopted to study the surface morphology of AlN films grown on nitrided and non-nitrided Al substrates. To more accurately study the surface morphology of Al substrates and as-grown ∼300 nm-thick AlN films, the root-mean-square (RMS) surface roughness of five points equally distributed on 1 × 1 cm2demonstration sample is collected illustrated in Fig. 2a, and the average value of these five values is used to represent the final RMS surface roughness, as shown in Fig. 2b. The error for the RMS surface roughness is within 5% based on the RMS surface roughness values. One can clearly find that there are many small islands existing on nitrided Al substrate surface shown in Fig. 2c when compared with the surface of as-annealed (non-nitrided) Al substrates displayed in Fig. 2d. Actually, the AFM measurement reveals that the RMS surface roughness of nitrided Al substrates is 2.5 nm, which is in striking contrast to that of non-nitrided Al substrates of 1.4 nm. These results prove that small islands are formed during the nitridation of Al substrates and the stoichiometry of N/Al in the nitridation layer is determined to be ∼0.90 by energy dispersive X-ray spectroscopy. After the nitridation, AlN films were then grown on these substrates. It was noted that ∼300 nm-thick AlN films grown on nitrided Al substrates show smooth surface with a RMS surface roughness of 1.5 nm, Fig. 2e. However, as for AlN films grown on non-nitrided Al substrates with the identical growth conditions, the as-grown ∼300 nm-thick films reveal rough surface with a RMS surface roughness of 4.0 nm shown in Fig. 2f. These results are ascribed to the nitridation of Al substrates, which can lead to the formation of AlN islands. On the one hand, the AlN islands can sever as a protection layer to effectively suppress the interfacial reactions between AlN films and Al substrates  and ; on the other hand, the AlN islands can act as nucleation center for the subsequent AlN film growth . Both of these two aspects benefit the growth of high-quality AlN films with smooth surface. (a) The scheme diagram of Al substrates with the size of 1 × 1 cm2, and (b) the RMS surface roughness of nitrided and non-nitrided Al substrates, and AlN films grown on nitrided and non-nitrided Al substrates. AFM image of (c) nitrided and (d) non-nitrided Al substrates. AFM images of ∼300 nm-thick AlN films grown on (e) nitrided and (f) non-nitrided Al substrates. XRD was deployed to further study the structural properties of ∼300 nm-thick AlN films grown on nitrided and non-nitrided Al substrates. The peaks observed at 2θ = 36.02° and 2θ = 76.40° are ascribed to the diffraction of AlN(0 0 0 2) and AlN(0 0 0 4) when compared with the JCPDS: Card No. 65-0832, respectively ; while the peaks observed at 2θ = 38.56° and 2θ = 84.60° are attributed to the diffraction of Al(1 1 1) and Al(2 2 2) when compared with the JCPDS: Card No. 65-2869, respectively  and . In this regard, the out-of-plane epitaxial relationship between AlN films and Al substrates is determined to be AlN(0 0 0 2)//Al(1 1 1). Furthermore, one can easily find that the intensity for AlN(0 0 0 2) and Al(0 0 0 4) of ∼300 nm-thick AlN grown on nitrided Al substrates is much higher than those of ∼300 nm-thick AlN grown on non-nitrided Al substrates, which reveals the high crystalline quality of AlN films grown on nitrided Al substrates. Additionally, Fig. 3a shows the typical φ scan of AlN(1 1 −2 2), from which six-fold rotational peaks with an interval of 60° can be clearly identified. These results confirm that single-crystalline AlN films have been grown on Al(1 1 1) substrates. The X-ray rocking curves (XRCs) measurement was carried out to further investigate the crystalline quality of nitrided and non-nitrided Al substrates. Fig. 3c reveals the XRCs for nitrided and non-nitrided Al(1 1 1) substrates, from which the full-width at half-maximums (FWHMs) both for nitrided and non-nitrided Al(1 1 1) XRCs are measured to be 0.5°, which demonstrates that the nitridation process does not harm the crystalline quality of Al substrates. Additionally, the crystalline quality of as-grown AlN films both on nitrided and non-nitrided Al substrates was also measured by XRC. Fig. 3d shows that the FWHMs for AlN(0 0 0 2) and AlN(1 0 −1 2) of ∼300 nm-thick AlN grown on nitrided Al substrates are 0.6° and 0.9°, respectively; while those of ∼300 nm-thick AlN grown on non-nitrided Al substrates are 1.1° and 1.5°, respectively. It is well known that the FWHMs for AlN(0 0 0 2) and AlN(1 0 −1 2) are related to the dislocation density in films. Furthermore, it is confirmed that the larger the FWHM is, the higher dislocation density in as-grown AlN films will be . In this regard, these results demonstrate the higher crystalline quality of AlN films grown on nitrided Al substrates compared with that of the AlN films grown on non-nitrided Al substrates, which is consistent with the result of surface morphology. 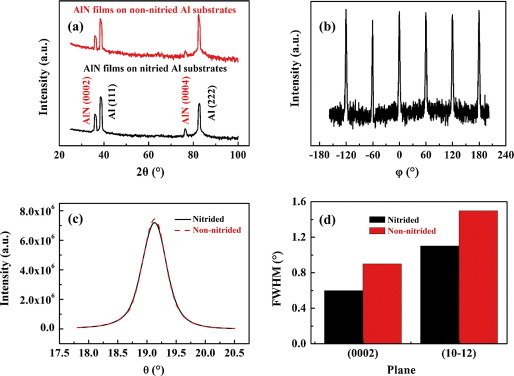 (a) XRD 2θ-ω scan for ∼300 nm-thick AlN films grown on nitrided and non-nitrided Al substrates and (b) φscan for AlN(1 1 −2 2). (c) XRCs for nitrided and non-nitrided Al substrates. (d) FWHMs of AlN(0 0 0 2) and AlN(1 0 −1 2) for ∼300 nm-thick AlN films grown on nitrided and non-nitrided Al substrates. Cross-sectional TEM was used to further study the interfacial properties of as-grown ∼300 nm-thick AlN films on nitrided and non-nitrided Al substrates. Fig. 4a shows a low magnification TEM image for AlN films grown on nitrided Al substrates, from which the thickness of AlN films is measured to be 301 nm. Meanwhile, sharp and clear interface between AlN films and Al substrates can be clearly found, as indicated by the dashed line. HRTEM was then conducted to further study the interface. As for AlN films grown on nitrided Al substrates shown in Fig. 4b, very clear and ordered atoms can be identified in the interface between AlN films and Al substrates for AlN films grown on nitrided Al substrates, and there are no defects can be found in this case. These results conform the high-quality of AlN films grown on nitrided Al substrates. Furthermore, the epitaxial relationship between AlN films and Al substrates can therefore be determined to be AlN(0 0 0 2)//Al(1 1 1), and AlN[1 −1 0 0]//Al[1 1 −2] by studying the spacings and . Based on these epitaxial relationships, another in-plane epitaxial relationship of AlN[1 1 −2 0]//Al[1 −1 0] can therefore be obtained, which is well consistent with the results achieved from RHEED measurement. The formation of this sharp and clear interface may be ascribed to two aspects. One is the nitridation of Al substrates, and the other is utilization of PLD technology. The former can lead to the formation of AlN island layers, which not only can effectively suppress the interfacial reactions between AlN films and Al substrates during the initial growth, but also can serve as nucleation centers for subsequent growth of AlN films. The latter can provide enough energy for the migration of precursors on the substrates, and thereby realize the growth of films at low temperature. However, as for AlN films grown on non-nitrided Al substrates, there is a ∼1.5 nm-thick interfacial layer existing between AlN films and Al substrates, as shown in Fig. 4c. In this interfacial layer, the atoms are disordered and many dislocations are formed here. The formation of this interfacial layer can be attributed to the serious interfacial reactions between AlN films and Al substrates without using an AlN protection layer  and . The dislocations may extend into the subsequent growth of films, leading to the poor-quality AlN films ultimately. Obviously, the nitridation process plays an important role in the growth of high-quality AlN films with sharp and abrupt interfaces. Cross-sectional TEM images for ∼300 nm-thick AlN films grown on nitrided Al substrates at (a) low- and (b) high-magnification. (c) Cross-sectional TEM images for AlN films grown on non-nitrided Al substrates at high magnification. Based on the above results, we therefore can conclude the growth mechanisms of AlN films grown on nitrided and non-nitrided Al substrates by PLD. As for AlN films grown on nitrided Al substrates by PLD shown in Fig. 5a, the AlN islands are formed during the nitridation process due to the reactions between Al atoms from substrates and N plasmas produced by RF. These AlN islands can act as nucleation centers for the subsequent growth, and eventually benefit to the growth of high-quality films. 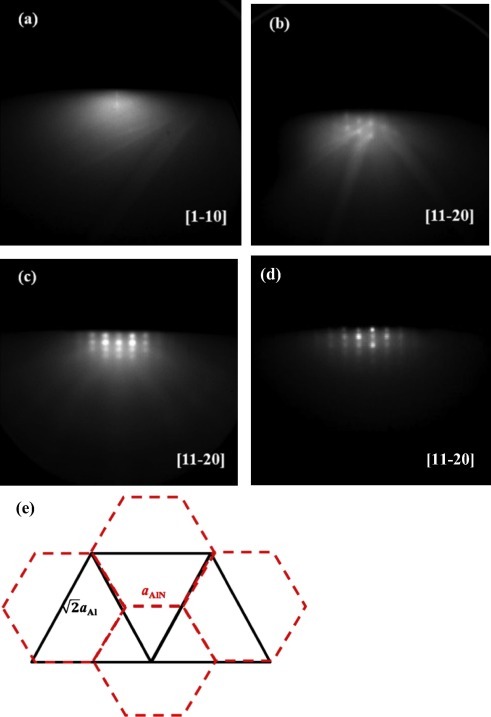 In this case, high-quality AlN films with smooth surface, high crystalline quality, and sharp and abrupt interfaces can be obtained, as shown in Fig. 4b. However, as for AlN films grown on non-nitrided Al substrates, as indicated in Fig. 5, during the initial growth, the serious interfacial reactions between AlN films and Al substrates are taken place, which results in the formation of a interfacial layer where many dislocations are existed. These dislocations will extend into the subsequent growth films and lead to the poor-quality AlN films ultimately. In this case, poor-quality AlN films with rough surface morphology, poor crystalline quality and thick interfacial layer are obtained, as shown in Fig. 4c. Conclusively, the nitridation of Al substrates can effectively improve the surface morphology, crystalline quality and interfacial property of as-grown AlN films by PLD. Schematic diagrams for the AlN films grown on (a) nitrided and (b) non-nitrided Al substrates. In summary, ∼300 nm-thick AlN films have been grown on nitrided and non-nitrided Al substrates by PLD. The surface morphology, crystalline quality, and interfacial property of as-grown AlN films were characterized by in-situ RHEED, AFM, XRD, TEM, etc., respectively. It was found that the ∼300 nm-thick AlN films grown on nitrided Al substrates show very smooth surface with a RMS surface roughness of 1.5 nm, high crystalline quality with AlN(0 0 0 2) and AlN(1 0 −1 2) FWHMs of 0.6° and 0.9°, and sharp and abrupt interfaces. These are in striking contrast to those in ∼300 nm-thick AlN films grown on on-nitrided Al substrates. We attributed the high-quality AlN films grown on nitrided Al substrates to two aspects. One is the nitridation of Al substrates, and the other is utilization of PLD technology. The former can form AlN islands, which can effectively suppress the interfacial reactions between AlN films and Al substrates during the initial growth. Meanwhile, the AlN islands also can act as nucleation centers for the subsequent growth. The latter can provide enough energy for the migration of precursors on the substrates, and thereby realize the growth of films at low temperature. Both of these two aspects lead to the growth of high-quality AlN films on nitrided Al substrates ultimately. Furthermore, based on the characterizations, the growth mechanisms for the AlN films grown on nitrided and non-nitrided Al substrates by PLD are hence proposed, which will be beneficial to researchers who want to fully understand the growth of AlN films on Al substrates. This work is of paramount importance for obtaining of high-quality AlN films for the future application of AlN-based devices.